As the world’s fourth most populous nation, Indonesia depends highly upon protein from the ocean to feed its population. It also has a rapidly growing economy fueled in part by the extraction of marine resources. The Indonesian government’s focus on development put a lot more emphasis on building the country’s maritime infrastructures, quadrupling its fishery production by 2019, and increasing the number of foreign tourists by more than two fold in 2019. Without sound information and decision-making tools that allow for consideration of ecosystems services values, attaining these ambitious development goals can threaten Indonesia’s rich marine resources and its highly diverse ecosystems. Mapping Ocean Wealth helps inform Indonesia’s marine management and address the nation’s conservation priorities. The Lesser Sunda Ecoregion is a biologically rich area covering over 35 million hectares of ocean and 10,886 kilometers of coastline. This region experiences dynamic oceanographic conditions including exceptionally strong currents of the Indonesian through-flow, where the upper waters of the Indian and Pacific oceans meet. These currents transport fish, coral and other invertebrate eggs and larvae, establishing the area’s rich coral biodiversity that is so attractive to many tourists. In addition, these strong currents and steep underwater cliffs cause major deep cold-water upwellings from which come rich nutrients and detritus from the seafloor that supports important fish and cetacean populations. 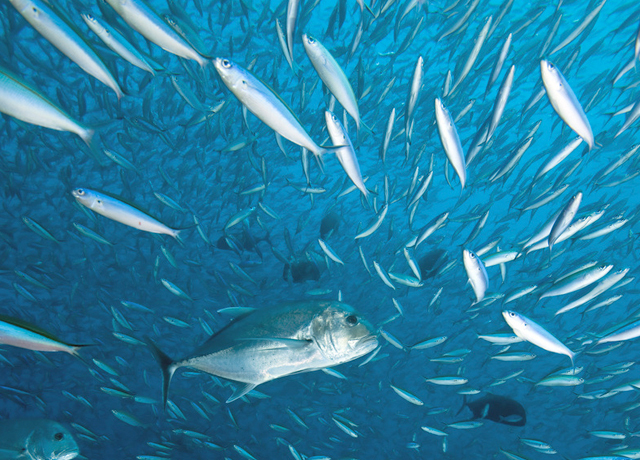 While much of the Mapping Ocean Wealth work has focused on structured habitats found near coasts, the importance of the waters of the open ocean in fisheries is also critical. These “pelagic” habitats are a place of continuous change as water moves freely from place to place. They lack clear boundaries, but they are far from uniform. Strong patterns in productivity indicate the importance of particular places and phenomenon in much the same way as more structured habitat. We began exploring such patterns in the Lesser Sunda Ecoregion. This region encompasses the southern margin of the Indonesian Through-Flow—the only deep-water connection between the Pacific and Indian Oceans. In this region, patterns of water flow reverse seasonally, but more importantly the water movements also drive a powerful upwelling, particularly in the Southeast Monsoon (April to November). The Mapping Ocean Wealth Team in Indonesia, working with partners in the Center for Coastal and Marine Resources Studies (CCMRS) and with Bogor Agricultural University (IPB), developed a model of pelagic productivity using data on temperature and sea-surface productivity. This model clearly shows the tremendously important role of monsoon upwelling in driving pelagic productivity in the Southeast Monsoon. Such knowledge will be of considerable value in developing management tools for the highly important tuna fisheries, which take place both in these waters and in adjacent international waters of the eastern Indian Ocean. View interactive maps from this project here. 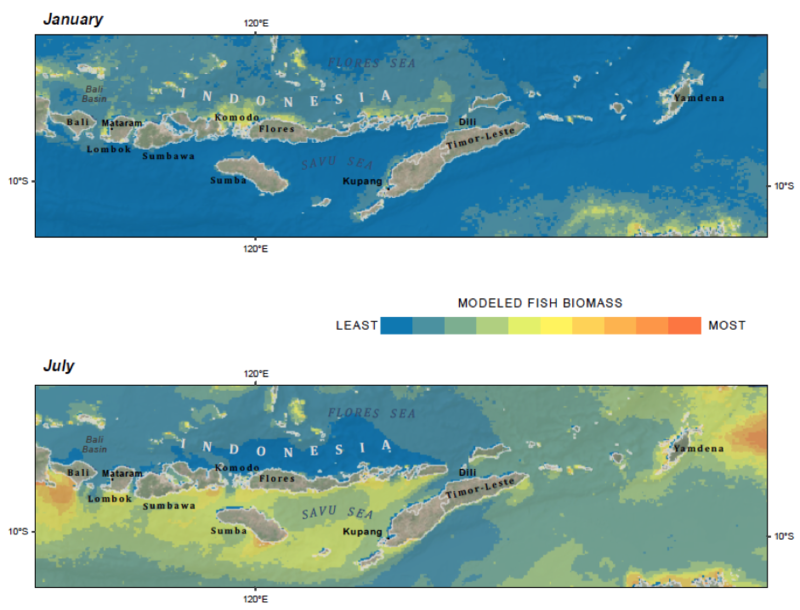 Using data describing sea-surface productivity and temperature, together with information about pelagic fish species, we can model the fish biomass for different seasons and highlight the enormous importance of certain areas and at different times for pelagic fish production. Using data from Mapping Ocean Wealth, the MOW team in Indonesia carried out large scale participatory mapping effort for the entire Lesser Sunda region. Under this work, the team developed participatory mapping protocols which were tested and refined to meet key objectives. As the ultimate output of this work, the team produced a map that describes human interests and how people drive the use of marine spaces in managing marine resources. Through this effort, the team was able to identify spawning aggregations, high-value fishery species, distribution of marine mammals, and other important information that was used to inform marine planning in Lesser Sunda (both at regional scale and for provincial coastal zoning). This information was also used to refine the Lesser Sunda MPA network design. Read the Lesser Sunda Participatory Mapping Report (available in Bahasa) here.